In 1926 my grandfather and uncle bought two small islands near the northwestern shore of Skeleton Lake. 91 years later those islands are still in the family and have provided countless memories for four generations. The first time I visited the islands I was two years old; the first time my son went he was 4 weeks old and learned to smile while he was at the island. There are so many ways we have enjoyed summers at the lake. We have listened to the patter of raindrops on the roof and heard the waves lapping on the beach. We have seen beavers, bears, deer, a porcupine, snakes, plus endless numbers of chipmunks and squirrels roaming through the woods and sometimes in the houses. Hummingbirds have dive bombed one another at our feeders; herons have left their footprints in the sand as they were surprised and flew as our canoe gently cruised by the weeds in the water; the haunting call of a loon sang us to sleep at night; cedar waxwings have perched on a dead tree over the water; swallows and robins have built their nests under the rafters and raised their families; seagulls have chased our boats to be sure we didn’t venture too close to their nests. We’ve had cold rainy days when we huddled under blankets by the fireside to keep warm and hot sunny days when we sat in the water to keep cool. In the daytime we have worked to maintain the property and during the evening we’ve played games together and strengthened our family ties. There have been happy times when we celebrated engagements, weddings, new babies, and children learning to swim and canoe, and times when we celebrated and remembered the lives of the first persons in our family who made it possible for us to continue to enjoy Skeleton Lake today. The thought that a place which means so much to all our family may be changed forever by blasting from daybreak to nightfall, by the vibrations it causes, by hearing heavy trucks carrying gravel and rumbling down a road that was not designed for this type of traffic all day long, by the danger of polluting the streams feeding into the clear water of our lake fills us with great concern. Peace and tranquility will no longer exist. My family and I strongly oppose the rezoning of property on Butler-Mill Road off Aspdin Road which would allow Lippa Pit and Quarry to begin operations and ask that this request be denied. Please forward this letter to other members on the Planning Commission. Scott May, President of the Skeleton Lake Cottagers Organization (SLCO), sent the letter below to the Township of Muskoka Lakes (ToML) Planning Director, David Pink, registering it’s opposition to an application by Mr. Frank Lippa to create a large pit and quarry operation on Butler Mill Rd, just north of Skeleton Lake off of Aspdin Rd. The SLCO feels the proposal, known as The Lippa Pit & Quarry (Lippa), could have a significant impact on the environment at the north end of the lake, the residents who access the area from Aspdin Road, and could potentially impact our water quality. The proposed Lippa operation would require an amendment to the Official Plan as well as changes to the zoning of the lands where the quarry would be located. The proposed amendments are to be considered at a council meeting scheduled June 16th at ToML council chambers in Port Carling. Why is this important to residents and cottagers on Skeleton Lake? The SLCO has reviewed various studies submitted in support of the application and has concerns about potential impacts on the environment, wildlife, pollution, traffic and water quality. Additional concerns are outlined in the SLCO letter below. P.O Box 129 Bailey St.
We understand the Council will be considering at its June 16, 2017 meeting, a proposal to amend the Official Plan and Zoning By-law in favour of the Lippa Pit & Quarry application. The Skeleton Lake Cottagers Organization (SLCO) is strongly opposed to these amendments, based on the following concerns. The applications propose a maximum extraction level of 200,000 tonnes per year. At the maximum extraction level, the operation would generate 100 truck trips per day, or 14 trips per hour. That equates to a truck trip every 4 minutes, 8 hours per day. Most of the traffic would go easterly to the Huntsville – Bracebridge market area. The greatest impact would be to those users of Muskoka Road #3 east of Butler Mill Road. Corridor. Consideration must be given to the conflict between shipping aggregates and the use of Muskoka Road #3 as a tourist, and especially a cycling route. While the traffic impact studies examine the impact of the operation on the function of Muskoka Road #3 as a traffic route, additional consideration is needed regarding the impact of the heavy truck traffic on the character of the road as a Scenic Corridor and cycling route. Further, those of us who have witnessed the evolution of that road from a gravel road, to a surface treated road, to a paved road of varying quality, question the impact of heavy truck traffic on the quality (or integrity?) of the road. We look to the District to examine the expected impact on Muskoka Road #3 in light of its quality and function. We note that the economic impact of the proposal identifies an annual payment of $3,000/yr to the District. This is about the same amount paid by residents of single lane private cottage access roads for annual maintenance and likely insufficient to maintain its condition under such loads. We also note that Section 14.7 of the Muskoka Lakes Official Plan indicates that aggregate operations should be in close proximity to a Provincial Highway. We note that the operation is 14 km from Hwy 141 and 21 km from Hwy 11. If 14 km is close proximity, then the policy does not really mean that much. The proposal includes a limitation of crushing activities within 2000 m of Skeleton Lake. Section 14.2 of the Township of Muskoka Lakes Official Plan states that no crushing operations can occur within 2000 m (2km) of the Waterfront Designation. The Official Plan defines the Waterfront Designation as being 150 m inland from the limit of the shoreline. Therefore, in order to comply with the Official Plan, the Zoning By-law and ARA license should impose a 2150 m limit on crushing operations from the shoreline of Skeleton Lake. While this distance should provide an adequate buffer under most conditions, we note that the prevailing winds in the summer months are from the north- west, potentially extending the area of impact of noise and dust. We would therefore request that, in the event that the applications are approved, the ARA license should prohibit crushing and screening on weekends June through September. Our greatest concern, as clearly enunciated in the Skeleton Lake Plan and Stewardship Program, is any impact on water quality. The operation proposes to extract below the water table, requiring de-watering of the site. This requires pumping water from the quarry to Lambert’s Lake Creek, which is one of the streams that feeds Skeleton Lake. The Hydrological Report and Site plan propose monitoring of water quality and quantity to ensure no net reduction in either criterion within Lambert’s Creek. The mechanisms that need to be employed to achieve this objective are complicated and require constant attention and monitoring. We also note that water quality testing in the creek showed slightly elevated levels of chromium (above Provincial standards). The SLCO would like to be informed with respect to how this monitoring will be peer reviewed and, in the event that the applications are approved, would like to receive monitoring reports that are produced as a condition of the ARA License. Finally, we are pleased to see that the Planning Justification Report contains a section (S. 13) addressing the SLCO Lake Plan and Stewardship Program. We appreciate the opportunity to review the Background Reports and provide meaningful input into this process. The SLCO would further appreciate an opportunity to meet with representatives of the applicant to have a more fulsome discussion regarding our concerns before Council makes a decision on the applications. Jeff Schosser – Ministry of Natural Resources and Forests, Bracebridge Caitlyn Port – Skelton, Brumwell & Associates Inc.
Skeleton Lake is very unique in many respects. It is the cleanest lake in the region with exceptionally clear contaminant free water. This is due to several factors. The most important is the fact that it is the only lake in the region with a limestone shell bottom. A geology/geomorphology professor, Michael W. Milner (now retired) has studied the region from north of Lake Simcoe through Muskoka to North Bay extensively. This region has numerous meteorite impact craters. According to Mr Milner these impacts have fractured the mantle and allowed mercury to leach through the fissures into the lakes. MNR studies have shown that fish taken from the surrounding lakes have very high mercury contamination due to this fact. Skeleton Lake is the only lake in the region that has a limestone shell bottom which protects it from mercury contamination. Also, being at the top of the water shed, other contaminated surrounding lakes do not empty into Skeleton Lake. Skeleton Lake is the only lake with clean water and no mercury contamination. Mr. Milner explained the effect of high volume quarrying. Removal of high volumes (mass) of stone in a confined area creates a differential pressure in the earths crust. Often “pop ups” occur as the pressure tries to balance itself. The stress created is particularly important in the area of impact craters where fissures already abound. Compounding the problem is the effect of blasting. Shock waves bounce off the fissures and cause them to refracture, thus opening the pathway for mercury contamination. This allows mercury to enter the ground water which drains into Skeleton Lake. The effect of blasting may also crack the limestone shell and allow direct mercury infiltration to Skeleton Lake. The water source for the proposed quarry is stream water indicating that surface water mercury contamination is extremely likely. Mr. Milner indicated that there are many remote areas more suitable for quarrys in the region. The proposed quarry on Aspdin Road is so dangerously close it poses a direct threat to Skeleton Lake as well as the residents in the area. Blasting shock waves from quarry operations travel great distances through bed rock (witness such damage done to homes near the Hutcheson Sand and Gravel quarry near Aspdin Road/ Ceasars Lane). The direct effect on aquatic life may be catastrophic. More research needs to be done to determine the effects of shock waves on aquatic life. There are many residential water wells in the area which will be affected by shock waves and mercury contamination from blasting, not to mention the devastating effects on the foundations and structures of residential buildings in the area. Mr Pippa is wrong when he says there are no significant buildings in the area. My home on Aspdin Road is a significant stone structure of 5000 sq.ft with a value in excess of three million dollars and it is within shock wave distance from the proposed quarry. Peoples homes are their castles and none can be treated as trivial in order to justify unacceptable behaviour by someone who wants to profit at their expense. The blasting is not the only source of shock waves. Imagine the vibration and noise from 140 heavy trucks travelling the same route in front of your home EACH DAY!!! Not only would this disrupt and endanger normal travellers and wildlife but affect our QUALITY OF LIFE. Aspdin Road is a windy, hilly road. It is dangerous at the best of times with normal traffic but heavy trucks in a hurry rarely stay in their own lane when negotiating these winding corners. Allowing such traffic on Aspdin Road WILL result in deadly crashes. Residents live in this area because of the clean air, quiet and serenity here. Our elected representatives have a sworn duty to represent those who have elected them, not those trying to harm us. It would be a travesty to allow the quarry to proceed at the express wishes against it by those who will be affected by it simply to put profits into the pocket of the owner without any perceptible benefit to anyone else and great trauma to the residents and ecosystem and the Muskoka way of life. The meagre benefit to the area of a maximum of 4 to 6 hourly paid employees it takes to operate a quarry does not warrant the ruin of our ecosystem and tranquility of the residents lives. The values of our homes will plummet as will our quality of life. The effects on tourism and cost of road repair are unacceptable. I am writing to express my opposition to the Lippa Pit and Quarry on Butler Mill Rd. I oppose rezoning my neighbourhood for extraction. We live on Aspdin Rd. For 7 months a year I can see up Butler Mill Rd from inside my home, and the northeast corner of my front yard is at the intersection of Butler Mill Rd and Aspdin Rd. The heavy use of this intersection by a large number of trucks will severely devalue my property by presenting health, safety, and noise concerns. Trucks screeching to stop or slowing to turn as well as accelerating up the hills will spew diesel exhaust, clutch and brake lining material (asbestos) and raise silica dust. There are about a dozen children within a mile of this intersection. We use Aspdin Rd and Butler Mill Rd recreationally for walking and cycling, but this will end when an average of 150 additional truck trips daily pass through it. The Township of Muskoka Lakes Strategic Plan states as a goal to “decrease noise and light pollution.” Running a rock crusher, heavy equipment, blasting, and thousands more heavy truck trips less than 2km from Skeleton Lake (and even closer to Mud Lake and Lambert’s Lake) would defeat that goal. No sound attenuation berm can effectively protect “Muskoka’s natural and unspoiled beauty”. Berms tend to work acceptably in noisy urban settings but not in quiet natural habitats. The “long term Parks, Recreation and Trails Master Plan” is not consistent with running many extra trucks on Aspdin Rd… although marketed as a nice cycle route it will be rather un-scenic and unsafe with extra dump trucks on this narrow, winding road without paved shoulders. The plan also states as a goal a “year round economic strategy” which is not consistent with pit and quarry operations. Our winter weather is too severe for pits and quarries to be significant year-round employers or year round license-fee-generators. The township states “We accept responsibility for decisions and actions” , but what will this look like in regards to the pit and quarry? If roads degrade, will the township take responsibility? If safety on the only possible haul route is compromised by unsafe passing of slow trucks, will the the township accept responsibility? When trucks leak and crash and close the main artery from Parry Sound and Rosseau to Huntsville, stopping residents from getting to work and children from going to school, will the township accept responsibility? When wells go dry or homeowners stop improving properties because this becomes a dirty industrial area, will the township accept responsibility? If every homeowner affected by the Lippa Pit and Quarry pays lower property taxes (than they would without an extra quarry) over decades what will that look like for the Township? The consulting agencies that published the proposals on behalf of Frank Lippa take no responsibility, and I invite you to find relevant evidence in the many pages of their reports showing why this neighbourhood should be rezoned. I am writing this letter to state my extreme opposition to the Lippa Pit & Quarry located at 1089 Butler Mill Road. I have taken time to read all 14 reports listed on the Muskoka Lakes Planning website. The following quotes were taken from the Planning Justification Report. On pg.36, “The proposed Lippa Pit & Quarry is located in an unpopulated, rural area of the Township of Muskoka Lakes, surrounded by densely forested vacant land.” This is incorrect; please see figure 1, a map of the surrounding area and who lives there. On Butler Mill alone, there are 3 year-round family homes. 1002 Butler Mill, family of 4 (whose family has owned land here since the 1950’s, the road is named after them), 1054 Butler Mill Road, family of 4 (lived here for over 5 years), 1152 Butler Mill Road, family of 2 (who have lived here for over 23 years). That totals 10 people who live on Butler Mill, this does not include the numerous other people who own land on Butler Mill that use it recreationally. For example, South part of Lot 4 Con 4, the Creasor,s (whose family has owned property here since the 1940’s). There are many others who live close by to Butler Mill Road, myself included. Within just over a Km there are 20 homes, 15 permanent family homes & 5 recreational homes and at least 12 children. To me, that is not unpopulated. 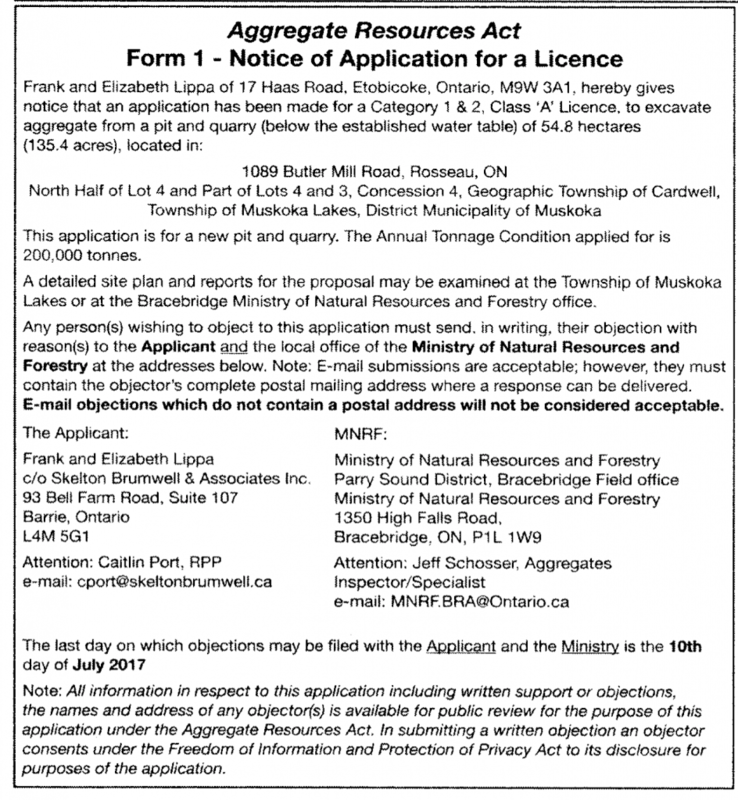 On pg.37, “The proposed pit & quarry is an economic opportunity which does not conflict with recreation or tourism or other rural uses in the Township of Muskoka Lakes.” So how many full time year-round jobs for Muskoka residents are guaranteed verses jobs for Mr. Lippa’s friends and family from Toronto? It most definitely would conflict with recreation, tourism and other rural uses! Due to the high volume of heavy truck traffic there would be conflicts with cyclists, homeowners along Butler Mill & Apsdin Road and the local businesses in Rosseau, such as the Rosseau Retreat Bed and Breakfast (located right at the stop sign on the end of Aspdin) and Crossroads Restaurant whose patio can be seen from the road. How many local businesses will suffer due to the increase of heavy truck traffic. On pg.38, “The proposed pit & quarry will support long-term economic prosperity & diversity of the rural economy by optimizing the use of land through resource extraction in an unpopulated area of the township.” Again, unpopulated means “a place with no people living there”, which I have proved not to be true. The amount of jobs produced I believe would be insignificant to the job market in Muskoka. Certainly not worth the potential contamination of the pristine Skeleton Lake and the negative impact of noise, air pollution and well water contamination to the countless people living along Aspdin Rd. On pg.41, “will be appropriately buffered & designed to ensure that there are no unacceptable impacts to nearby sensitive land uses”. I do not believe they can accomplish this at the proposed pit and quarry location. It would be impossible. Yes, I have read all the Reports and I don’t think that the noise, dust and possible contamination of water could be contained to their property only. An unacceptable impact for me would be the extreme heavy truck traffic passing my door every 4.4 minutes. You can’t tell me that I wouldn’t feel or hear the blasting from this quarry, especially on a clear quiet day. The proposed site encompasses a percentage of the Skeleton Lake watershed and it is less than 2 km away from the lake. Skeleton Lake is such a rare treasure in all of Canada since it was formed by an ancient meteor strike and scoured by several ice ages. Due to the spring fed nature of the lake, the water is exceptionally clean and clear. Do you really want to take any chances contaminating such an exceptional natural wonder? Once the water becomes contaminated you can’t put the pollution back. On pg.43, “operation activities will not be visible from Aspdin Rd”. Except for the heavy trucks coming out every 4.4 minutes! On pg.43, “The development of the pit & quarry will not conflict with the tourism base of Muskoka.” This is utterly false. Of course it would conflict with the tourism base! What about the numerous cyclists who use Aspdin Rd? They use Aspdin Rd from Huntsville to Rosseau. Do you think they will feel safe and have an enjoyable ride with all the extra heavy trucks on the road? It is dangerous enough as it is. What about people using Aspdin Rd as a scenic drive? Would they like to be stuck behind a convoy of gravel trucks? What about the quaint village of Rosseau? Would their tourism base not be affected by all these extra heavy trucks? Would the trucks not negatively impact the Rosseau Farmers Market on Fridays? On pg.46, “There will be no negative impacts to the scenic corridor along Aspdin Rd, due to the development and operation of the pit and quarry.” “No scenic vistas will be impacted by the development of the quarry. There will be no impact to the tourism industry resulting from the quarry development & operation.” I respectfully disagree with these statements. Of course there will be negative impacts to the scenic corridor and the tourism industry! Again, let’s think about what a significant increase in heavy truck traffic will mean to cyclists, cottagers, full time residents and the village of Rosseau. According to the Planning Justification Report on pg.32 the Township of Muskoka Lakes will receive $12,000 a year and the District of Muskoka will receive 3,000 a year from Mr. Lippa’s Pit & Quarry. Is that amount of money really worth destroying the lives of people who live close to the proposed pit & quarry and those along the haul routes? Nobody I have spoken to (and there are many) want this pit & quarry. There are many other locations across Muskoka that would be much better suited for this type of development. On pg.58, “Any use which a third party makes of this report, or any reliance and or decisions to be made based on it, are the responsibility of such third parties. Skelton, Brumwell & Associates accepts no responsibility for damages, if any, suffered by a third party as a result of decisions made or actions based on this report.” So according to this statement then we should not take these reports seriously since they will not stand behind them. That takes all liability away from Frank Lippa and the company that produced the reports. If it is in fact reliable data that we can trust and believe in, then why not stand behind it? Who is going to fact check those reports? Where are the Road Geometric reports evaluating the only possible haul routes along Aspdin Rd? There was only a small mention in the Traffic Report of the poor sight lines at the intersection of Butler Mill Rd. and Aspdin Rd. I would like to know about the many curves and hills that would compose the 21 km to Hwy 11 and the 14 km to Hwy 141. Are the roads wide enough to safely accommodate the trucks, and would there be enough road clearance on the unpaved shoulders? I would like to see mention of the narrow bridge on Aspdin rd (close to 5400 Aspdin Rd). It is currently in rough shape and will cost a huge amount to upgrade. Will there be mention of the countless wetland habitats that are found along Aspdin Rd? I would like to know who will pay for all the road upgrades once Aspdin Road is destroyed by these extraordinarily heavy trucks from the quarry? There are already numerous pit & quarries that service the Muskoka area. Are you also aware of the close proximity to the Eastern Cardwell Forest Conservation Reserve, which is protected area? No mineral exploration or mining is allowed here. Please see figure 2, this map shows how close this pit & quarry will be to protected lands. I encourage you to research this. More information can be found at: https://www.ontario.ca/page/eastern-cardwell-forest-conservation-reserve-management- statement. Or you can simply google “Eastern Cardwell Forest Conservation Reserve C102”. 1. Negative impact on air quality from dust pollution with this type of industry and trucking haul route. Citizens living adjacent to pits and quarries or in surrounding areas have a higher instance of bronchitis, emphysema, asthma and other respiratory illnesses. Fine dust particulates are particularly hazardous to children and the elderly. 2. Proposed pit and quarry will be operating above and below the water table leading to potential contamination of ground water and surface water. Numerous water wells and Skeleton Lake are at risk. 3. Negative impact on species of special concern and rare wildlife – bird species such as the Eastern Wood Pewee and the Wood Thrush and turtles such as the Snapping Turtle. 4. Lower property values along Aspdin Road and haul route. 5. Heavy use from trucks will put wear and tear on our municipal roads leading to higher taxes and road delays. 6. Negative impact on safety – Poor sight lines on Aspdin Rd means it will be less safe for cars entering and exiting driveways/side roads, school children getting on and off the bus, pedestrians, and cyclists. 7. Proposed pit and quarry will be operating 7 days a week, Monday to Friday 6:00am to 9:00pm and Saturday and Sunday 9:00am to 9:00pm . 8. Increase in heavy truck traffic will have a negative impact on tourism on and near this designated scenic route and will affect local businesses in Rosseau. 9. Negative impact from extra noise and vibration from trucks traveling on haul route, blast zone and processing materials. 10. There will be a massive increase in heavy truck traffic on Aspdin Rd — an average of 150 heavy trucks per day at capacity, which translates into 1 truck every 4.4 minutes. I’ll leave you with one final question. Would you want to a new pit & quarry next to your house? My name is Tom Newman, and I am a cottager with life-long ties to Skeleton Lake and the surrounding area. I am strongly opposed to the proposed Lippa pit and quarry. I have recently been voicing my concerns, and have spoken with Donald Furniss (Mayor of ToML), Allen Edwards (Councillor Ward B, ToML), Linda Barrick-Spearn (Councillor Ward B, ToML), Gault McTaggart (Councillor Ward B, ToML), and David Pink (Director of Planning, ToML). Several things became clear to me from these conversations. First, it is vital for those, opposing the Lippa pit and quarry, to turn up en masse, at the ToML meeting in Port Carling, on Friday, June 16, to voice our displeasure. The more people who are prepared to make personal sacrifices to attend this meeting, the greater impact we will have. Second, it is important for us to have speakers with persuasive and well-researched arguments to make submissions at this meeting. Each speaker will be given 5 minutes, and must not exceed this time allotment. Given so little time, it means that the most effective way for us to cover all the key points, is to divide up the sub-topics amongst the speakers, with each submission focussing primarily on one or two of these areas (e.g., threats to water quality, negative impact on tourism, increased noise levels from pit operation and trucks, destruction of natural habitat, etc.). If you are planning to make a submission, please let us know the main focus, so that we can help to coordinate the content, in order to avoid excessive repetition. Finally, we will be facing off against a team of professional consultants from S. Brummell and Associates, who have prepared the reports that we will be contesting at the June 16 meeting. These reports are available at the ToML website (muskokalakes.ca), and are recommended reading, especially for those of us, who plan to make submissions. Please use the Contact Us link at the top right if you have any questions or concerns about the blog content, or if you have information to share.